Premise 1 – Chess is fascinating. Premise 2 – Bobby Fischer is the most fascinating player in the history of the game. Try the supreme yet brief BBC documentary – click here and play the third video down. I dipped into the world of David Foster Wallace for the first time recently, boy its pretty deep. DFW was an American author of contemporary fiction who committed suicide last year. Here’s his mammoth article, E Unibus Pluram, on televisual dominance, irony and the future of modern fiction for your reading pleasure. You’ll need an hour or two combined with peace and quiet, and probably a dictionary, but it’s well worth the effort. If you want to start with something lighter then I suggest this stunning article about Roger Federer, a truly gladdening piece of literary sports journalism. If you really want to go deep then Infinite Jest is where it’s at…I’m still psyching myself up. 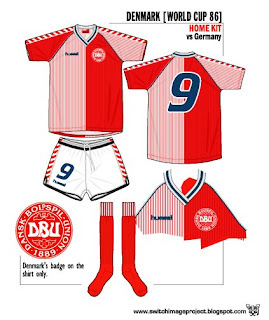 I read this exceptional article about the Denmark national team circa the early 1980’s when it first appeared on the Guardian website a couple of weeks ago. It is a great example of the new standards in web-based journalism. Leaving aside it shooting economic models of the media to pieces, the web gives a unique visual context and depth to this article. Whilst I do vaguely recall the beautifully designed Hummel kit – I seem to recollect Southampton having one too – I was too young to remember any of the key moments featured in this excellent piece. With video only a click away, so too further reading, I can witness and contextualise the very moments that inspired the author’s reminisces. Furthermore it is purely an internet-only piece, not for print. Not so unusual, but if admire the length of the article – no advert or page limitations here – then you begin to understand that this article is conceived and delivered with the internet in its heart. It just wouldn’t be the same in print.